All three types of systems use heat pumps that are located in buildings and cool by removing indoor heat and rejecting it to the exterior GSHP loop. For heating, the process is reversed as heat is removed from the outdoor loop by the heat pumps and is delivered to the building. Geothermal Heat Pump Systems are increasingly being utilized in the commercial and institutional sectors because the economics of GHP systems can be very attractive for large buildings. GHPs often eliminate elaborate and expensive equipment and controls while providing high efficiency and comfort. Proper design and implementation of GHP systems also have the long-term advantage of reducing maintenance requirements and costs. Each project site presents many variables to consider before determining the viability, type, cost, and effectiveness of a GHP systems. A deep understanding of system design, water wells, installation guidelines, and equipment is required to choose and implement the right GHP system for any building. Simply attaching a ground heat exchanger, groundwater loop, or surface-water coils to conventional water-cooled HVAC systems (e.g., chilled-water variable-air-volume systems) usually results in higher than necessary installation costs, poor efficiency, and added maintenance requirements. – Do they understand how to optimize the efficiency of Geothermal Heat Pump Systems? – Do they possess the technical and hands on experience, skills, and competencies regarding water wells? – Will the system that they design minimize the use of fossil fuels and deliver cost savings? – Do they understand how to compensate for the range of performance due to changing weather patterns? – Can they demonstrate how the system design will justify the short-term installation costs by delivering long-term cost savings? – Are they innovative problem solvers that can assess the specific strengths, weaknesses, and opportunities of your site to design and install a system that delivers the expected ROI on the project? 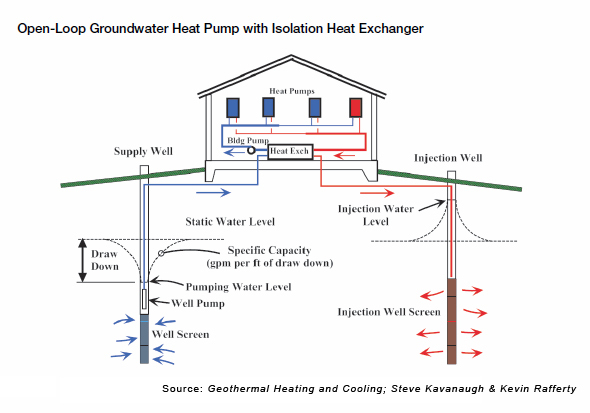 Over 90% of the Geothermal Heat Pump Systems (GHP) are designed and installed as a closed loop system. KluberGeo has the skills, competencies, and experience to investigate and analyze each individual site to determine the best approach. Understanding every component of closed loop systems, open loop systems, and standing column well systems allow the KluberGeo team to maximize performance and minimize costs. The essence of GHP systems is groundwater. Groundwater transfers energy to and from the earth. KluberGeo has the skills, experience, and knowledge of GHP systems, water wells, and water well pumping systems to ensure that your GHP system is designed and installed to produce optimal results. This comprehensive understanding and the ability to adapt an interworking of all groundwater systems allows KluberGeo to design the GHPS system that is right for your site. The GHP industry’s approach to design and installation of closed loop heat pump systems is to provide additional energy sources for extreme operating conditions. The source for this additional energy is normally fossil fuel based. KluberGeo has a comprehensive understanding of groundwater and how to effectively use groundwater in the design of your GHP system to deliver the additional Btu’s necessary for your building and to reduce the use of fossil fuels. Operating performance becomes the primary design parameter after a closed-loop heat pump system is installed. Expanding capabilities of a closed-loop system requires the addition of loop wells (very costly) or the addition of conventional HVAC equipment. KluberGeo has comprehensive knowledge of groundwater so we have the ability to adapt the use of groundwater into the most cost effective design of the loop well field. This means that the systems we design have the ability to compensate for temperature extremes and deliver the lowest possible operating costs. KluberGeo designs GHP systems that maximize the use of low-cost renewable energy to significantly reduce utility and system maintenance costs. We are able to investigate and analyze each individual site to determine the best design for your GHP system. We focus on balancing installation costs with the expected reduction in utility and maintenance costs. We are often able to augment the ROI of a project by helping our clients find and apply for available energy grants and incentives. 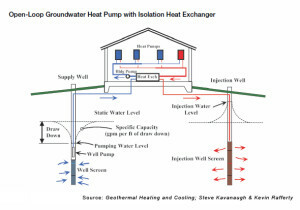 We are innovative problem solvers with a comprehensive understanding of all components of Geothermal Heat Pump Systems. The KluberGeo team has industry leading knowledge, experience, and installation of GWHP systems, water wells, and water well pumping systems that ensure successful projects. Knowing “how to fix” and “how it works” is critical to “how to design”. Our extensive problem solving experience with water wells and water well pumping systems provides unparalleled insight into how groundwater impacts the operation of GHP systems.